Tricky 2016 questions from marrying rocks to replacement rock stars. The Picture Round is on The Years News (2016) and the Wild Card Question is a time stat on a potty mouthed pop princess. Here’s four samples from the 40 (plus bonus) questions included in the download. The samples are from each of the four themed rounds, 2016 General Knowledge, 2016 Music, 2016 Sport and 2016 Film & TV. The download contains 1 x PDF with the answers under each question, 1 x PDF without the answers (if you fancy playing yourself!) and a text version so you can copy and paste into your own Quiz format. Q09. In March which famous award winning artist announced they had married a rock in their back garden? Q12. In May who stepped in as a temporary lead singer for AC/DC? Q21. During a Swedish football match in June a player was sent off for farting… was it a straight Red Card or a second Yellow that got him expelled? Q32. 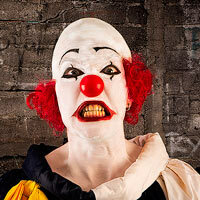 In which February released movie is there a superhero with the alter ego Wade Wilson? Here’s a low-res sample of The Years News Picture Round, click for a higher resolution version. The Picture Round download is a two page high quality PDF with the answers on page 2. 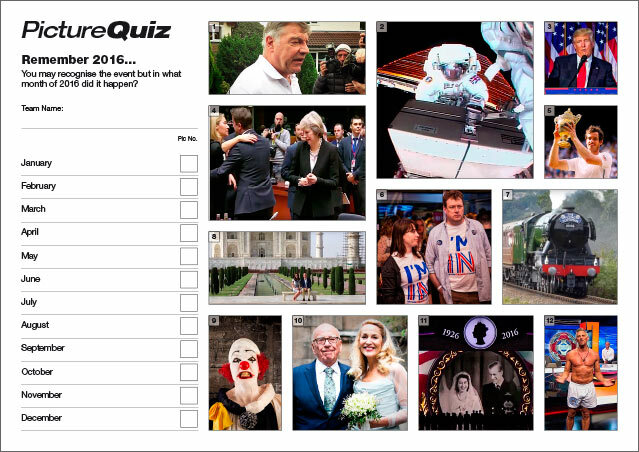 The NYQ16 Picture Quiz is match the Years News with the month. The Wild Card Question for Quiz of the Year 2016 is a time average on the potty mouthed pop princess Adele.